Questions about purchases should be directed to the church office. The annual UUFR Service Auction is a wonderful opportunity to support UUFR and have fun at the same time! 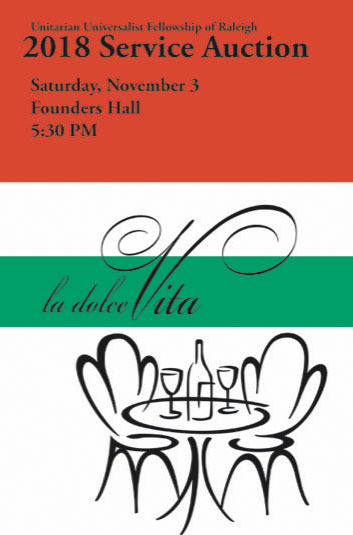 Join us for a sophisticated Saturday evening of Italian fare and get ready to bid on your favorite items! Sunday afternoon, we will be offering a free pizza lunch to everyone participating in the raffle drawing (up to 150 people seated). Reverend Osterman will be drawing the winning raffle tickets while you enjoy a delicious lunch with the family in Founders Hall. Bring the kids! Service Auction (Saturday): $10 early bird (before September 30) or $15 at the door. Children: Free admission, but please let us know if you need childcare in advance. Service Auction, Nov. 3rd, dinner at 5:30, auction at 6:30. Pizza Lunch and Raffle, Nov. 4th at 12:15. How: Tickets will be on sale in September for the Service Auction. Tickets for the raffle will go on sale in October. What: A ticket will get you a bidding paddle, catalog and seat for the Service Auction with a full-course meal , drinks, and dessert. Wine and beer will be available for $3. Live Auction: Primarily services or activities offered, for example: dinners, outdoor events… with the highest bid winning. Silent Auction: Primarily objects, for example: quilts pictures, musical instruments… Written bids, highest bidder wins. Fixed-Price Auction: Events or services offered by donors for a set price to a specific number of people, for example: rides to the airport for $10, meals offered for $20 for up to 8 people, homemade note cards for $15 offered to 3 buyers.